Come try the, “World’s First Free Cyber Cafe”. Your restaurant savings could pay for your stay! 134 Modern Rooms and you can park by your door! We now have 47 free carport parking spaces! 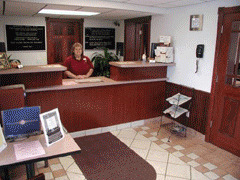 All rooms include: Wall Mounted 37” LCD HDTVS with 75 Cable channels plus 3 HBO’s, DVD/CD Player, Refrigerator, Microwave, Free Safe, Coffee Machine, Iron/Board, Hairdryer, Clock Radio, Free Wireless Internet, and Data Port Phones with free local calls, Plus Free Laptop usage in our lobby. We also have a Guest Laundry and Exercise Room. We’re only 1/2 mile from the Odawa Casino, Shopping, & Restaurants. We have AARP, AAA, and Business rates, plus we offer discount coupons on water park and lift tickets. You’ll love our view of Little Traverse Bay!